"I didn't start out trying to make a creamy zucchini recipe, but when I glanced in the fridge and saw the last crumbled remains of fresh cream cheese, I knew those green cubes sizzling away in the skillet were about to get enriched. While I'd normally have a hard time feigning such excitement over squash, I'm actually quite thrilled with how this came out." Heat olive oil in skillet over high heat; stir in zucchini, lemon zest, and red pepper flakes. Cook for about 2 minutes. Stir in salt, black pepper, and cayenne pepper; cook and stir until zucchini is tender, about 5 minutes. 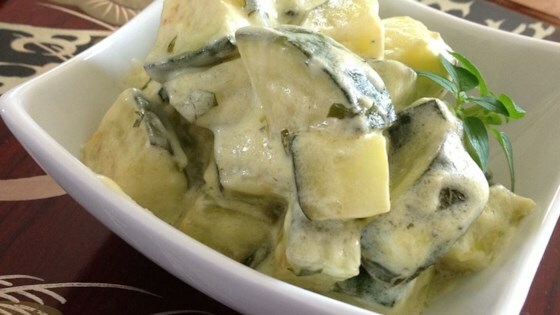 Stir cream cheese into zucchini mixture; cook until cream cheese begins to melt, about 1 minute. Remove from heat and stir in oregano. This was yummy! Next time, I would halve the amount of olive oil - this was just dripping in extra oil. Great topped with some Parmesan cheese. Tasty, easy, recipe. I used a veggie cream cheese because I had some in the fridge. Turned out great! Even my kids liked it. I am making this tonight again. It is so good but extra lemon and less olive oil.